Smita Patil would have been 60 on October 17 had fate not cruelly snatched her from us in 1986. She was only 31 when she died. Rediff.com salutes the incomparable actress in a special series. Dinesh Raheja and Jitendra Kothari look at some of Smita Patil's BEST films. The role that established 22-year-old Smita Patil as an actress of extraordinary merit. It remains, arguably, her best work. Director Shyam Benegal scaled this film on a creatively ambitiously level. The talent involved was uniformly megawatt. Girish Karnad and Satyadev Dubey wrote the screenplay and dialogue on which Vijay Tendulkar also collaborated. Govind Nihalani was the cinematographer while Naseeruddin Shah, Amol Palekar, Amrish Puri and Anant Nag played the pivots around whom the life of the heroine (played by Smita) revolved. Bhumika proved to be the high point of the art movement in the 1970s. The film's inspiration was 1940s actress Hansa Wadkar's autobiography. Bhumika's Usha is an actress, whose need to 'find' herself and an illusory contentment encompasses several broken relationships. She finds that men in her life -- whether weak or strong -- seek to commodify her or reduce her to 'role' playing a part in their fantasy. You may question Usha's choices as she goes hurtling through her turbulent life, but you can't hide your fascination as she skids off the rails and then struggles to get back on track again. Benegal reveals a genuinely complex vision as he captures the neediness, insecurities and creative temperament (her abandoned child looks at her with such mute, indicative eyes) of a woman who struggles as much with the dichotomy inside her (between her liberated and domesticated selves) as she struggles with a male dominated world outside. This heavily atmospheric film draws you with its magnetism -- the Indian film industry, from 1930 to 1950 serves as a fascinating backdrop, the radio broadcasts capture the changing time periods and the sepia tones for the flashbacks scenes all add immeasurably to setting up the mood. Smita has perhaps never looked as soul-searingly natural and beautiful as she does here. She completely seems to share her character's psychic space. Yet going beyond the instinctual, she shades her scenes with the right amount of thought and doubt. It's a magnificent performance that's never less than three dimensional. 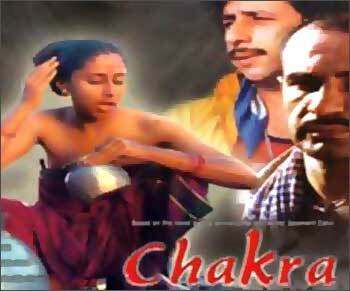 This film won Smita Patil yet another National Award for best actress after Bhumika. Chakra, a surprise box office success, was a strident wake up call, rousing us to the seemingly inescapable 'chakra; of fate that governs the lives of millions of Mumbai slum-dwellers. Smita plays a migrant who comes to Mumbai, but finds little succour in the city of dreams. After she loses her husband, she ekes out an existence in the slums. Hers is a character that is not romanticised or glorified but drawn with a level eye -- she has a couple of affairs (Naseeruddin Shah, Kulbushan Kharbanda). It's a Darwinian situation where survival is all that matters. Brimming with squalor and seediness, the story is realistically but grippingly told. Its hard-hitting credo predates Chandni Bar. Smita's hopes have survived in her son on whom she has pinned her expectations, but the wheels of fate grind inexorably on. In Chakra, Smita looks far removed from the gloss and glamour of Bollywood, blending seamlessly with her character. As part of her research for the film she visited slums on Tulsi Pipe Road (north-central Mumbai), returning home with parched lips and chipped nails. She imbues her performance with a hard-won empathy. Unfortunately, a bathing scene of Smita splashed on the film's posters became the most recognisable symbol of the film. It gave the film a notoriety and maybe success too. The film's promising director Rabindra Dharamaraj, unfortunately, passed away in the year of its release. Namak Halaal was not one of the most intellectually demanding roles of Smita's career. But, arguably, more people have seen Smita Patil in this super-successful film than in most of her other films put together. That certainly makes it one of her most memorable films. Prakash Mehra's Namak Halaal established Smita's versatility as an actress and proved that she could be accepted as a commercial heroine who could dance and sing songs. The film is essentially a showcase for Amitabh Bachchan, but Smita is all cool efficiency and bemused intelligence as the employee of the hotel Amitabh chooses to do his bumbling act in. As his girlfriend, she is all sensuality. A white-sari clad Smita proved she could move with grace and do her own version of the rain dance in the superhit song Aaj Rapat Jaaye Toh Hamein Na Uthaiyo. Smita was not afraid to take on grey-tinged roles. In Bazaar, she played a woman manipulated by her lover into arranging a nubile match for a rich old man. In Arth, she played Kulbhushan Kharbanda's actress girlfriend, for whom he leaves his wife, Shabana Azmi. Her Kavita of Arth is a successful actress who is terrified of losing her married lover. Teetering between sanity and delusional insecurity, guilt and self assertion, she becomes an obsessive, tantrum-throwing wreck. Shabana had the sympathetic, wronged-woman role, but Smita had several big dramatic sequences in which her mastery over her art was more than evident. Watch her fascinating range of expressions in scenes like the one of her in front of a mirror where Shabana's voice haunts her. Or the scene in which she hits Kulbushan and then hits herself. The mix of emotions she brings to her final breakdown scene before Shabana is amazing: There's a need to expiate her guilt, there are remnants of arrogance and there is pure terror at losing her mind. It's a startling, high-octane, performance that compels admiration. Arth is loved by many feminists who like the fact that the wishy-washy guy eventually gets the boot from both women; and that both the female protagonists finally arrive at some meaning in their lives. Smita already shared tremendous chemistry with Girish Karnad in an earlier film, Manthan. Subah cast them together again, but as a combative couple. Jabbar Patel made this film in Marathi as Umbartha and in Hindi as Subah. Released within a few months of Arth, here was Smita in a role and a performance that was a striking contrast. After the abandonment of Arth with its somewhat over-the-top, melodramatic histrionics, Smita was full of quiet reserve and dignity in Subah. In the film, Smita takes up a job as the superintendent of a Mahila Ashram, far away from home and husband. There are moments of serenity (the wonderful song: Tum Asha Vishwasa Hamare), but Smita has to also tackle the demands of a tough job. Her husband, she finds, is not so supportive after all; and Smita eventually finds her strength within her own self. Said to be a personal favourite of Smita's, Subah is another film with a strong femininst message: All women should discover their own identity. Smita pulls the theme together with her strong central performance. Smita Patil did some remarkable work in off-beat films of the mid-1980s, like Kumar Shahani's much praised Tarang, T S Ranga's Giddh, Utpalendu Chakrabarty's Debshishu and Johny Bakshi's Raavan. But these films barely got a theatrical release and few people saw them. By this time Smita had been inducted into commercial cinema, especially after the success of Ardh Satya and Aaj Ki Awaaz. J Om Prakash's Aakhir Kyon? is her most significant film from this period. In Aakhir Kyon?, Smita is the wronged wife. 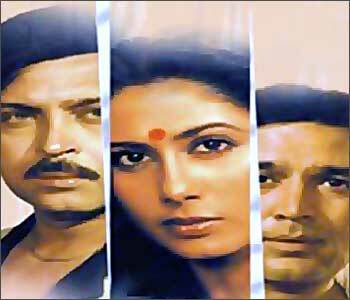 Smita's marriage to Raakesh Roshan crumbles after he has an affair with her cousin, Tina Munim. Thrown into the world, Smita makes a name for herself as a novelist. She also finds a sympathetic friend in Rajesh Khanna. But the crux of the story is her reaction when the tables are turned and the balance of power vis-a-vis her husband is in her favour. Yes, once again Smita plays a woman who shakes off the yoke of male patronage and, well, finds herself. Dushman Na Kare Dost Ne Woh Kaam Kiya Hai -- Smita's well picturised theme song in which she lets fly at her squirming husband and Tina, was very popular. Aakhir Kyon? showcases a Smita from a later stage of her career with perfect make-up. She looks good and exercises fine control of her expressions; but that characteristic elemental energy seems dammed and tamed even if rightly channelised. Often mistaken to be Smita's last film (actually several of her films were released thereafter), Mirch Masala was the first important release after her death. In this superior Ketan Mehta venture, Smita plays the fiery Sonbai who works in a mirchi factory and takes on some of the product's pungency. She refuses to give in when the tinpot despot of her area (Naseeruddin Shah) casts a covetous eye on her. He bends every rule in the book to have her while the villagers watch helplessly. Finally, Smita and a group of fellow female workers barricade themselves behind the gates of the factory. Naseer lays siege outside. The psychology of those under siege -- literally and figuratively -- is beautifully captured in the film. The sometimes-contentious sometimes-collaborative relationship between the group of women in the barring out is also well portrayed. Smita, of course, is resplendent as the indomitable woman who discovers that self determination can be had even with the help of some mirchi powder. Cate is awesome. Will she win an Oscar again?